Very recently, the 12th Hyundai–Kia International Powertrain Conference was held near Hyundai’s South Korean R&D centre where the company unveiled its current and future engine and transmission line-up. The company showcased plenty of its powertrain technologies and the cheif among them were the next generation of turbocharged petrol engines that the company is currently developing. Officials from the company say that these small displacement turbocharged gasoline powertrains will be offering high performance along with low fuel consumption and CO2 emissions. Hyundai is also actively pursuing research of Gasoline Direct Injection (GDI) technology into sub 2 litre engines and showcased its 1.2 T-GDi engine at the conference. The GDI technology, although is very attractive from the fuel economy and performance standpoint, has not been a favourable ne among manufacturers till now because of high cost of development. Hyundai is already offering its T-GDI (Turbo Gasoline Direct Injection) technology in 1.6- and 2.0-liter engines and is now expanding its application to “small, yet strong” units, keeping in line with the downsizing trend that has spread across the industry. Also Hyundai showcased its new 1.0 litre TCI (Turbocharger Intercooler) at the conference. This engine produces 105 BHP of peak power and 137.3 NM of peak torque. 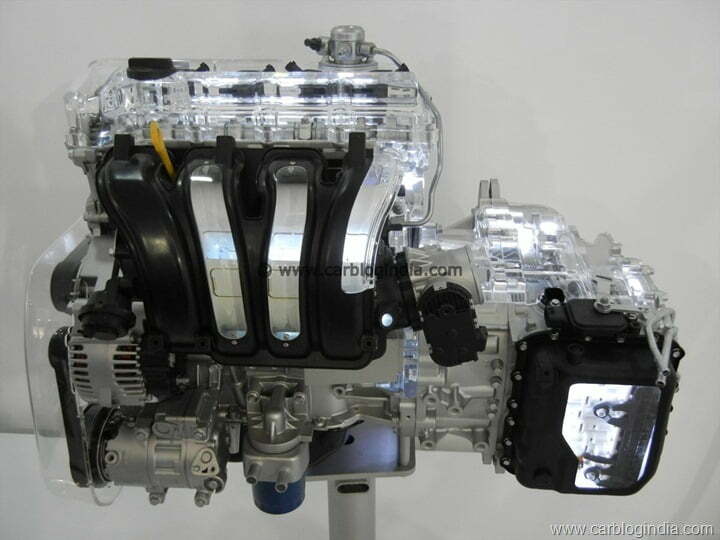 The entire engine is made of aluminium with plastic intake manifold and engine head cover. It also features, as the name suggests an integrated turbocharger. Other units on display were the Gamma 1.6 T-GDI, Nu 2.0 CVVL and Theta 2.0 T-GDI petrol and the U2 1.1 WGT and Euro 6-compliant 2.0-liter diesel engines, as well as the Kappa continuously variable transmission (CVT). Hyundai said that the wide range of engine options will help the company to offer customized powertrains suitable for each region by region. For example, the company is planning on introducing its T-GDI-engine models in major markets like the U.S. and China and flex fuel engines to other markets where the demand exist with the proper fuel availability.